Today, Digiarty Software proudly announced that Air Playit had reached 2 million downloads. Air Playit, good at streaming any video and music to iPhone, iPad and iPod touch via WiFi, 3G or 4G, has become the No.1 free iDevice audio video streamer app in the world so far. Today, Digiarty Software proudly announced the good news that Air Playit had reached 2 million downloads over the past 6 months. Besides, this software good at streaming any video and music to iPhone, iPad and iPod touch via WiFi, 3G or 4G was further confirmed to be permanently free. So far, Air Playit is the No.1 free iPhone/iPad video audio streamer in the world. -	Streaming DRM video to iPhone, iPad and iPod touch wirelessly was allowed. -	Multi-tasking Music Background Playback was supported. -	Music file could be downloaded directly without the need of playing. -	Hardware encoding with CUDA to the server was enabled. -	Compatibility with Google Android was realized. Moreover, Air Playit News was added for convenient User Guide viewing; H.264 encoding speed and quality was improved; 1080P HD videos can be played more smoothly and the background music playing was made more stable. 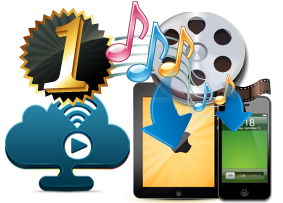 So it has ranked the top 1 free audio video streaming software for iPhone, iPad and iPod touch up to now. Air Playit is also defined as a personal audio video cloud, making audio video files in 320+ different formats instantly playable on iPhone and iPad. By virtue of local or remote WiFi, 3G and 4G, this freeware even makes incompatible M2TS, AVCHD, MKV, AVI, WMV videos or DRM protected videos wirelessly streamed to iOS Devices without the use of iTunes or other video converter software. Air Playit server and client are free available now and forever. 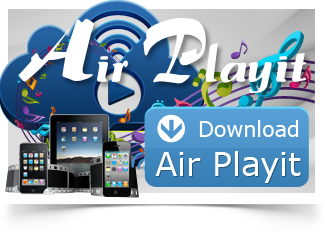 Air Playit Client V2.0 for iPhone, iPad and iPad Apps can be obtained free from Apple's App Store.